‌A package of donated laundry detergent clearly pleased the high school student — which ‌surprised the United Methodist volunteer at the Neighborhood Market project in John Marshall School, Oklahoma City. The volunteer said he’d never had to think about that when he was growing up. OKC-Nichols Hills United Methodist Church, the Regional Food Bank of Oklahoma, and the public school have joined to provide food and basic supplies to John Marshall students who otherwise might not have enough. Approximately 84 percent of the seventh- through 12th-graders at John Marshall are assisted by the government’s free/reduced price lunch program, according to district statistics from the previous academic year. The project has "opened a lot of people’s eyes to what’s going on in our community," said Stephanie Henry, the church’s lay leader. Some of the church members are school alumni. Nichols Hills Church got involved because the school needed someone to manage provisions available through the food bank. The idea intrigued members of the church, who agreed to put together what is being called Neighborhood Market, which began in November. Church volunteers staff the market at the school on Fridays. Students make their selections at lunchtime and stash the items in their lockers until it’s time to go home so that they have food on weekends. "It’s really been a movement of the Holy Spirit in our church," said Senior Pastor Trevor Smith. Popularity of the market has grown, thanks to "the welcoming nature of the adults we have serving there," he said. "There seems to be a lot of joy and happiness." He estimated as many as 200 students have picked up food and basic supplies. Food selections include individual bowls of cereal, fruit cups, and easy-to-heat soup, chili, and stew, he said. Before long school breaks, students are encouraged to take extra food. In addition to the food bank supplies, church members have donated Bibles, hygiene items, and clothing. Laundry detergent has proved a popular non-food item. Some students who had been quiet and withdrawn have cheered up now that they’re able to wear clean clothes to school, Henry said. Dress shirts and ties are offered to boys who need appropriate clothing for special events such as senior luncheons. Volunteers also have been building a changing room so students can try on clothing without having to change in a restroom. Church members who volunteer regularly have built friendly relationships with the students. Rev. Dr. Smith described the market as a "boomerang blessing — our lives are changed too." He’s noticed "a lot of excitement in our church. The ongoing nature of that really excites me." The church has "some people of means that have big hearts," he said. Henry helps coordinate the volunteers from the church. She expected their number to grow to 30 by the end of February. As volunteers have gotten to know the students, "each story is more heartbreaking than the next," she said. Church members have come to cherish their roles at the market, she said, telling Henry that more volunteers are welcome, "but they’re not taking my spot." Smith said he sees the potential for other growth, such as a satellite worship service held at the school, located at NW 122nd and Portland since 2005. "You never know what could emerge," he said. 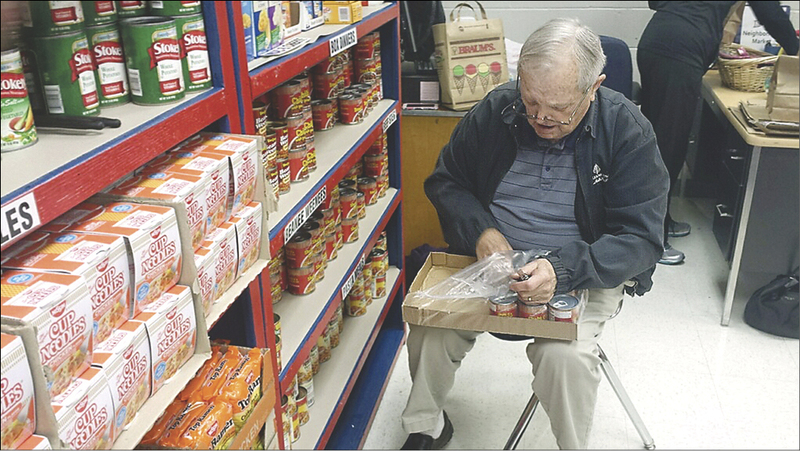 OKC-Nichols Hills volunteer Paul Lindsey stocks the Neighborhood Market at John Marshall School. 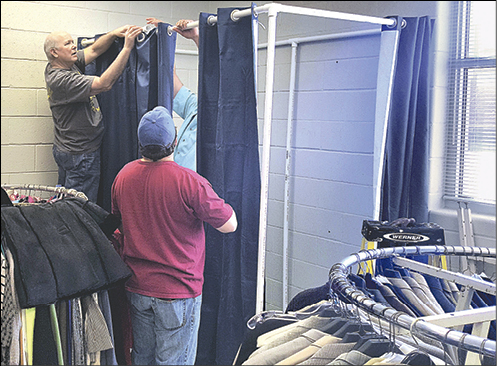 Volunteers from OKC-Nichols Hills set up a changing room at John Marshall School so students can try on donated clothes.